Are You Looking for New Kitchen Cabinet Doors This Fall? Replacing the sink faucet and getting new appliances will go a long way towards impressing your neighbors, but there’s more to do. Think about what you can do to update your kitchen cabinet doors. A wise man once said that life starts again in the fall. With that in mind, bring some new life into your home by changing how your kitchen looks. Replacing the sink faucet and getting new appliances will go a long way towards impressing your neighbors, but there’s more to do. Think about what you can do to update your kitchen cabinet doors. Sometimes, simplicity is best. With the slab-style kitchen cabinets doors in place, you can keep your new space simple. These doors help to create a sense of smoothness and unity throughout your entire kitchen. The only drawback is that compared to the other doors, slab style is surprisingly expensive. However, if your cabinets don’t have frames on them, then these doors are going to be your best bet. The shaker style doors are another classic choice you can add to your kitchen. Depending on the material you used to build your kitchen cabinets, shaker doors could be what you’re looking for, especially if your cabinets are made of woods such as maple, oak, or cherry. It’s also possible to find these doors primed for paint, although it isn’t as common. Are you looking for something more dramatic with your new kitchen design? Then shake style kitchen cabinets doors will help you achieve that goal. After all, their frames are beveled at a ninety-degree angle relative to the door panel. This emphasizes the shadow effect that is more striking to the eye. The traditional style door will usually be finished in wood, although it’s also possible to find them made of medium-density fiberboard with a thermofoil finish. These doors are rounded at the top with a flourish known as the cathedral top. 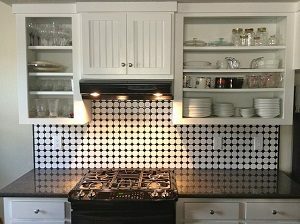 Because this type of kitchen cabinet door is relatively inexpensive, it’s the one you’ll see in rental properties such as apartments, or in homes with recently remodeled kitchens done on a tight budget. These kitchen cabinet doors can hold panes of glass. The glass shows what’s inside the cabinet without the viewer having to pull the cabinet open. They are called window style because they look like mullioned windows that you’d normally find on the exterior part of a house. That said, if you are going for a traditional aesthetic in your timeless kitchen, then these kitchen cabinet doors are a great fit. No matter what type of kitchen fixtures and hardware designs you choose, WalterWorks Hardware has the expertise and supplies you need. We are well known through the Maryland, Washington, D.C., and northern Virginia area for our fantastic hardware and unbeatable knowledge. For more information, please give us a call at (410) 263-9711 or contact us online. For more tips on choosing hardware for your home, follow us on Facebook, Twitter, LinkedIn, Houzz, Google+, and Pinterest. This entry was posted on Friday, September 21st, 2018 at 4:47 pm. Both comments and pings are currently closed.